Are you looking for information on how to split wood with a wedge? 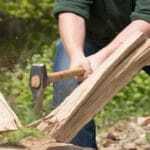 Wondering if there are any perfect steps and guidelines that will help you in splitting wood with a wedge easily? Then, don’t sweat out any longer! You have come to the right place! 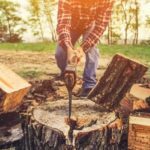 In this article, we’ll be guiding you with 14 ultimate steps and answer all the questions that you will be having regarding splitting wood with a wedge. How to Split Wood with A Wedge? You need to get yourself few essential tools for wood splitting. 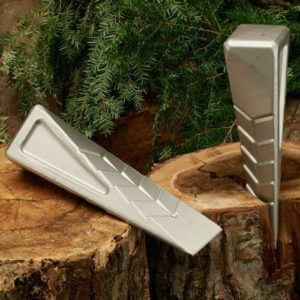 These are: wood splitting axe, sledgehammer, chopping block and lastly a steel wedge. Keep more than two steel wedges as you might be needing more than one if you face any sort of difficulty while splitting the wood. To begin splitting, you will first need to cut the wood into the shortest length possible using a chainsaw. However, remember that the length you cut should be usable for splitting and not way too much short. This step is required because it is difficult to split wood that has a longer length. To split the wood, you will be needing support to keep your wood on. For that support, cut a log into a small piece using an axe, you don’t need too large sized log. The log will be acting as your support or a splitting block to be more precise. By keeping the wood on the splitting block you will be able to work easily using the steel wedge and sledgehammer. Woods have cracks or naturally occurring splits in them. These splits occur if woods dry up. These are the weakest part of the wood and also the best part for you to begin your splitting with a minimum effort. Aim that individual crack for splitting and hit your splitting maul one or two times. You will then see the formation of a large crack. The point at which you will want to hit the maul should be measured beforehand and marked. You will mark the position by using the maul and aiming the target when you are holding the handle of the maul. You will then need to prepare your splitting maul in an appropriate way to hit the wood. Once you have been sure of the target, bring the maul at an upward motion towards your shoulder with a slow speed. And then bring the maul downwards to the point you wish to split at a much greater speed and force so that the wood splits up. The wood will not split up completely if the hitting of the maul is not strong enough. There is no need to worry and surely you don’t need to redo the whole process. Look for any wide cracks that occur due to the hitting of the maul instead. Now comes the actual function of steel wedge which is your savior. Dig in the wedge inside the crack that seems wide to you. After placing the wedge inside the crack appropriately, use a sledgehammer to give a solid hit to the wedge. This will result in further penetration of the wedge into the wood and your wood will begin to split. Don’t hold your wedge while hitting it with a sledgehammer. You could hit your fingers with a much greater force instead which can turn out to be miserable. Keep hitting the wedge with the hammer until you witness that the wood has split completely. If you see that the wedge has not penetrated inside the wood completely and your wood did not split yet, then your wedge is not thick enough. To make sure that wood splits, add another wedge into the crack and repeat the process of hitting the wedge with a sledgehammer. Even after wedging using two wedges does not split the wood completely, then it is some of the splintered woods that is causing the disturbance. To ease splitting, you will need to chop off some of the splintered wood grains around the large knots. Using all the steps above, first split the large woods into halves and split those halves into halves again. This is done to narrow the size of the woods. Splitting wood becomes much easier if the wood is made narrow. Collect all the woods that you have split and compile them together. Allow them to dry under sunlight. Lastly, always take good care of your tools. After finishing all your work regarding wood splitting, sharpen and clean all the tools. This is because tools tend to lose their sharpness after every use. Sharpen your tools every time you do the wood splitting. This helps you to maintain the durability of your tools and also, they will last longer. To conclude, all the steps listed above have surely cleared all your doubts regarding how to split wood with a wedge. The steps include the right way of how you should be using your tools. To begin splitting of wood, make sure you have all the tools that have been listed. And of course, you need to always remember that your safety matters the most. Lastly, by following step 14, always take good care of your tools. Repurchasing, again and again, is not only cost ineffective but annoying as well. Taking good care of yourself and your tools will surely help you save up a good amount of bucks. 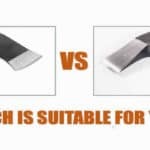 Axe vs Maul: Which is Suitable for Splitting Your Firewood?